Dean is back today after not fishing Sunday. We load up and head into city around 7am. I had hoped to get going a bit earlier today but as usual work was late and we get started fishing at 8am. We are fishing One dead and One live on Two rods each today . The deads are soon out and i set about catching some live baits on a float rod. Although there are fish topping all over, bites are few and far between. Eventually after changing shotting, depths and hook size, i start to catch Roach. The only trouble is, the fish are too big for what we need for baits, averaging Six to Eight ounces. There is no instant start today, we have to wait almost Two hours before Deans live Perch is taken. Just as Dean is about to set the hooks, my dead sardine is snapped up too. Unbelievably we are both playing a fish at the same time. 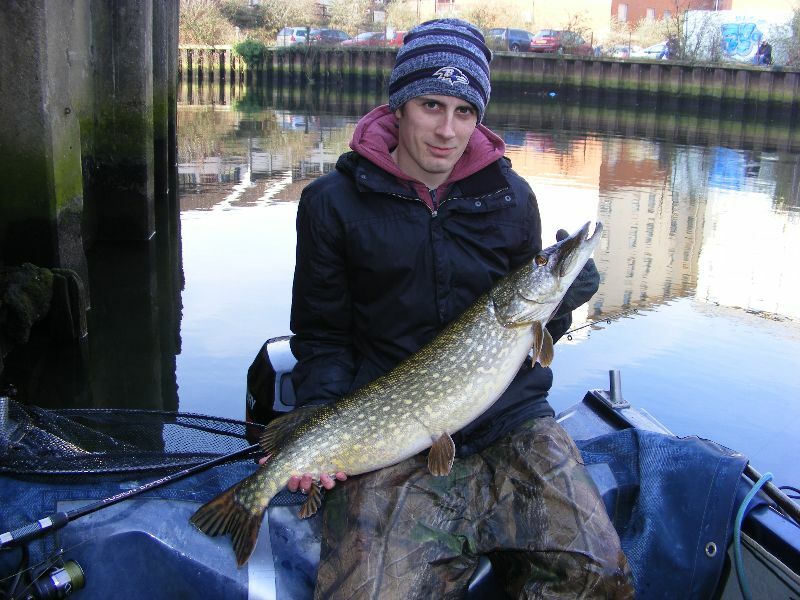 Deans fish is plodding about fairly deep so i quickly get my fish, about 8lbs, into the boat, un hooked and straight back. Deans fish puts up a lovely fight and im quite surprised when a fish of just about Ten pounds is netted. Both rods are re cast, mine with a Smelt and Deans with a live Roach this time. Its only another Fifteen minutes before Deans live bait is off again. This turns out to be another lively Jack of about 7lbs which i un hook in the water. Just as im thinking we might be into a few fish again today,it all goes quiet. We have a brew up and contemplate a move, but as we can see the skies are looking clear and bright, we decide to stick it out here where the tall buildings will keep us in the shade and hopefully help to keep the Pike feeding a bit longer. We try various bait changes and tweaks but its just after midday, nearly Two hours, before Dean gets another take on a small live Perch. This feels feels bigger straight away and it even makes Two or Three good runs taking line off the reel. As the fish comes into view in the clearing water, we can see its a decent double. The scales confirm it as 14lbs 9oz. Looking at our diary, we can see the small live Perch baits are performing much better than the Roach lately and also picking out the larger fish. The sun then makes an appearance almost overhead so we decide to head back home a bit earlier. On the way back through the city, we see quite a few anglers on all of the various access points but not many of them appear to be catching much. As we leave the city and head out into the countryside, plenty of people are out enjoying the sunshine walking the banks near Whitlingham country park. A sure sign spring is definitely on its way. Fingers crossed the weather does not get any better for just another week or so. After that, bring on the sun !! Cheers. Im convinced its the light levels triggering feeding in this part of the Wensum. Im going to invest in a light meter next season and monitor the levels to see if there is a pattern.